While we all appreciate brand new technologies, sometimes there is nothing more satisfying than a mainstream slugfest caused by the introduction of a new GPU. That's especially the case when a new architecture is brought in to supplant ageing cards with similar performance. NVIDIA's unveiling of the GeForce GTX 1660 Ti is sure to accomplish that, and has already prompted price adjustments to older cards competing with the new upstart. Without a reference design the full complexion of the segment will only become clear as more models are tested, but it's obvious from ASUS's pricing guidance that the ROG STRIX variant will be at the high end of this cohort of cards. NVIDIA have stipulated an MSRP starting from £259.99 inc. V.A.T. ; this model sits beyond £330 in the UK (though actual retailer price is expected to vary and may stabilise closer to £300 than £350), and at a more aggressive $569 AUD in Australia. Such has been the penalty for the premium features incorporated into the STRIX graphics card range, often to its detriment when in the mainstream segment. Make no mistake however, the performance of this card is exceptional for a relatively modest GPU. NVIDIA's guidance consistently compares the GTX 1660 Ti with the GTX 1060 6GB, but the ASUS ROG STRIX trades blows with the GTX 1070. Taken in isolation, anyone upgrading from a graphics card three years old that isn't a GTX 980 or 980Ti will get a huge boost in performance. Furthermore, as good as the GTX 1070 is, it is an old technology. New games benefit more from Turing's architectural features, and so opting for a GTX 1660 Ti will be future-proofing yourself to a certain extent. It would also be an exceptional partner to 1080p variable refresh rate monitors that adhere to NVIDIA's G-SYNC or G-SYNC Compatible standards. This card in particular is more than capable of pushing >100Hz at 1080p in the most popular games on the market today, while being a solid if unexceptional GPU for 1440p gaming. The trouble arrives when you compare the ROG STRIX GeForce GTX 1660 Ti with the RTX 2060. The latter is also new technology based on the Turing architecture, incorporates RT and Tensor to support NVIDIA RTX technologies that are slowly being added to games, and offers much better performance in rasterised rendering. All that would be fine if there was a clear price separation involved, but there isn't. An RTX 2060 can be picked up for as little as £299.99 inc. V.A.T. at the time of writing, and proven good quality variants are available at NVIDIA's £319.99 MSRP. In Australia however it comes in a little under the typical entry-level pricing of NVIDIA's RTX 2060. A better appreciation of the ASUS ROG STRIX GTX 1660 Ti's position will be possible when we've gone over other GTX 1660 Ti models. The proprietary feature set ASUS ROG offer with this model is extremely compelling, especially if you already own an array of ROG/Aura Sync lighting system components. But many seem tailored to higher price brackets where there's more separation between performance bands, and are out of place when competition is fiercer and consumers are more sensitive to pricing. 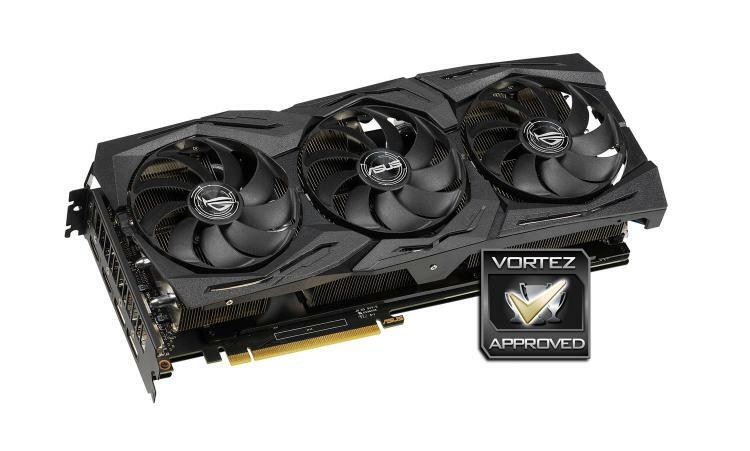 The ASUS ROG STRIX GeForce GTX 1660 Ti is likely to be one of the best GTX 1660 Ti's available, but only the most ardent UK fans of ROG premium features will jump on one without considering similarly priced GeForce RTX 2060 alternatives. Australian gaming enthusiasts will however be much more positively inclined towards the ROG STRIX due to its more competitive price in that territory.